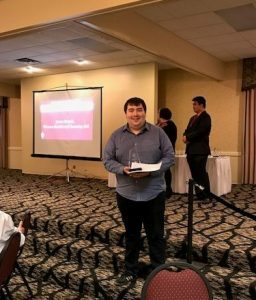 Earlier this month, Jason Smyth, Residential Security Aid (RSA), posted at Watson Hall, received a Spotlight of the Year Award on behalf of the Office of Residence Life. This award recognizes an outstanding person who is NOT a member of the Office of Residence Life including, but not limited to a DPS Officer, faculty/staff member, food service personnel, RSA, student organization, etc. for their outstanding contributions to ORL and Syracuse University community. tstanding RSA for obvious reasons. He has the most positive and radiant personality that immediately makes people feel valued and heard. He listens to the RA staff and residents and brings suggestions or advice when necessary. He greets everyone that passes, while asking how they’re doing or what their plans are for the night. More than anything, his genuine desire to interact with others and build relationships shines through in every conversation. There’s not a single person in the Watson/Sheraton community that has not at least witnessed Jason’s joyful nature. As the RSA for this semester, Jason serves at the Watson front entrance. His service requires ongoing efforts on his part to facilitate proper resident safety procedures. He commits a large portion of his time just simply conversing with residents to develop a more open community. During his late nights, he is always bring humor and ideas to brighten RAs’ nights. He encourages every staff member to speak about their concerns or just simply chatting. He continues to listen to RA problems and voices any advice he may have for certain situations. One example of this that impacted me personally was when coming back to Watson after a day of multiple projects and struggling with roommate conflicts. It had been a long day, filled with unexpected events that made me feel overwhelmed, and stressed. I walked by Jason and he asked how I was doing. We ended up having a long conversation and offered advice to help lighten my day; He has yet to know how much that moment completely made my night. I ended that night feeling encouraged and comfortable, and it’s all thanks to his earnest words and kind actions. Jason’s list of positive contributions to our community could be listed on and on, and I’m confident that everyone who knows him personally would agree with that. The most impressive thing about Jason to me, beyond his motivating personality, is how much he values his position as a RSA on campus. He recognizes the potential of a position like this, especially as it pertains to the lives of our residents and building staff. He understands the issues that impact SU students on a daily basis, and does his best to fit their needs and be there for anyone who needs a friend. Jason is a naturally born leader who is determined to help others in every capacity. I highly recommend that he be considered for this honor; He has been nominated multiple times within the past year alone, and it’s been established as to what an asset he is to residence halls and our community. I know that he would also be extremely honored to receive a recognition like this, as his hard work definitely deserves it. Congratulations, Jason! We are honored to have you as part of the Students for Community Safety team at the Department of Public Safety!